2. Extracts from Article "InterNations Report: Israel Fourth Best Place to Raise your Children By:JNi.Media." According to the InterNations survey's Family Life Index, in a roundup of the world's 41 top countries to raise a family in, the best three countries are Austria, Finland, and Sweden. And right behind those wealthy, industrialized European nests of socialized everything and the baskets of goodies from the nanny state, in fourth place, you'll find a country that's been fighting for its life for almost 70 years, with a huge security budget, supposedly enormous gaps between rich and poor, and ceaseless ethnic strife, and there, according to the survey's criteria, is the fourth best place on the planet to raise your children. Go figure. For comparison, the UK came in at 22nd place. The US in 25th place. France in eighth. New Zealand came fifth. Availability of Childcare and Education, Israel was ranked 4th, behind Austria, Finland and Sweden. 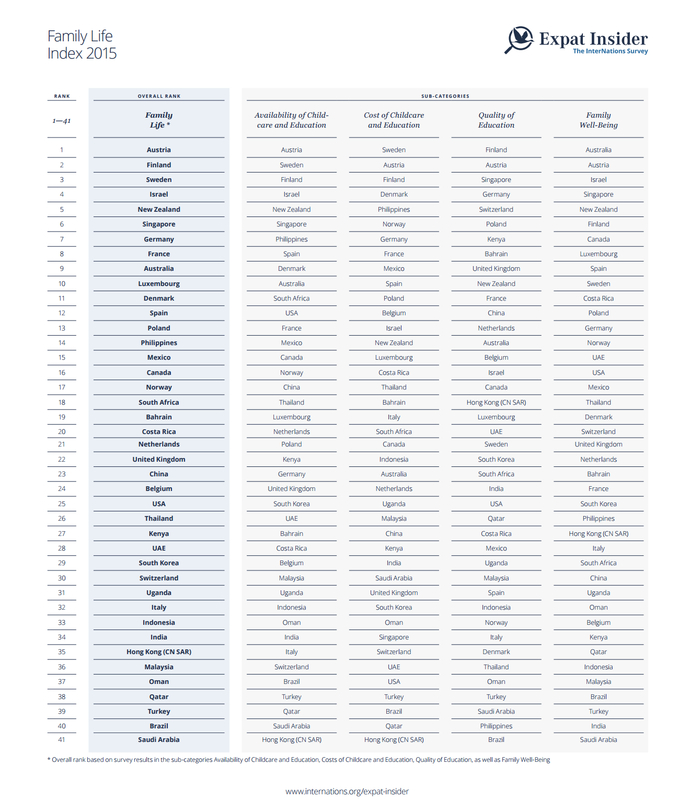 The US ranked 12th, France 13th, the UK an abysmal 24th. Cost of Childcare and Education, there Israel was ranked 13th, with Sweden, Austria, Finland and Denmark at the top of the list for state-paid education for everyone. France was ranked 8th, the US 37th, right behind the United Arab Emirate, and the UK was in 31st place. Quality of Education: OK, Israel was ranked only 16th on that one, which could, to be honest, bring into question the entire celebration we've been having here. So, it's available and it's relatively cheap, but maybe you get what you pay for? Finland, Austria and Singapore, where they cane you for spitting on the sidewalk, lead the bunch, with Kenya, surprisingly, in 7th place (it's where US presidents get their diplomas, after all). The UK is in 9th place (which is still behind Kenya), France is 11th, the US is 25th. 'Nuff said. Finally, there's the category of Family Well-Being: Israel is ranked 3rd on that one, behind Australia and Austria. Because, let's face it, Israel is essentially one big family, occasionally happy. The US is 16th (better than we expected, to be honest), Sweden is 10th (on account of the suicides and those truly depressing movies), The UK is in 21st place, and France in 24th. In the top ten we have 2 Edomite nations (Austria no.1, and Germany no.7) and 7 basically Israelite ones. We suspect that concerning Israel (no.4) the ultra-Orthodox achievements were greatly underrated. If what the Ultra-Orthodox acheive was properly evaluated and factored in then Israel would be in first place.